THIS SITE AND ALL MY CORVETTES ARE DEDICATED IN LOVING MEMORY OF OUR SON CHAD. Welcome to the Home of B & V Vettes, Caldwell, Ks. As you browse through the following pages and pictures, you will get to see my Collection and Display of all Six Generations of AMERICA'S SPORTS CAR! We are located on Hiway 81, 60 miles south of Wichita, Ks and just 13 miles west of the South Haven, Ks. exit on I-35. Presently, our hours are by appointment only. Call me at 620-845-6726 or 1045 and if I'm available, I'll be more than willing to show off my Collection and Display. A Special Thanks to "VETTE MAGAZINE" and it's May 2011 Issue, Vol 35/No5 for having us be a part of "The 'Glass Menagere". You will get to see my 1957 245HP Roadster, which was on display at the National Corvette Museum till Nov 2006, she's now back home as of 10 Oct 06; 1967 427/435HP Coupe, 1982 Collectors Edition, 1988 35th Anniversary Edition; 1993 40th Anniversary Edition ZR1; 2003 50th Anniversary Edition Convertible, which we picked it up at the National Corvette Museum on 12 September 2002; and on 22 April 06 I picked up our latest edition to the collection, a 2006 Velocity Yellow Z06. I also want to take this opportunity to Thank Our Troops and the Coalition Forces that are risking their lives that others may be FREE and for those that have made the Supreme Sacrifce. All Six Generations of America's Sports Car on display here in Caldwell, KS, the Border Queen City. Here you can see All Six Generation in my Corvette Museum Showroom. My '57 is just back from a year of being on display at the National Corvette Museum in Bowling Green, KY.
On 23 January 2011, I added a link on my Guest Book Page to our NEW FACE BOOK PAGE. http://www.facebook.com/pages/B-V-Vettes/128659453861697. leave all your future commets there. Thanks. On 6 September 08, I got my latest addition for my Grand daughter, which will be 2 on 1 December 08. It's a purple 2008 C6 convertible Kidstrax 12v car. Pictures will follow soon. On 2 October 07, I added pictures of my Z06 with Black Hood Stripes and painted Fuel Rails & Halltech Air Bridge to My Z06 Slide Show. On Labor Day, the 3rd of Sep 07, I had all 7 of my corvettes for a day of driving and photo's. 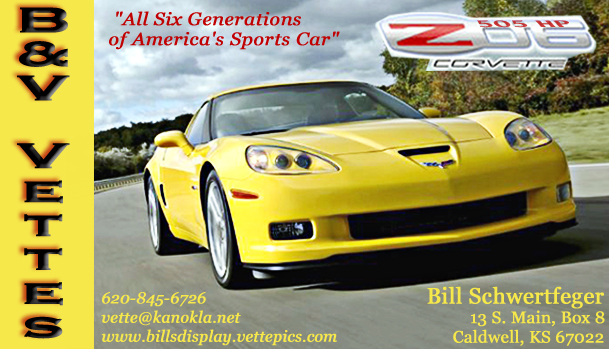 I added pictures to the end of my Corvette Slide show page, titled All Five Generations (Really All Six Generations). On 10 October 2006, I brought home my '57 from being on display for a year at the National Corvette Museum. On 9 September 2006, I sold my 1999 Torch Red Corvette. On 30 May 2006, I changed All Pictures to Thumbnails for a Faster Load. Then you can just click on the pictures for a Larger View. On 27 May, I placed my 1999 Torch Red Coupe for Sale. On 13 May I added more Slide Show pictures of the Z06 here in Caldwell, KS. On 5 May, I added more Z06 pictures from our trip to Estes Park, CO. to the Slide Show. On 27 Apr after a Vettpics.com Web Bug lost several of my photo's after upgrading to a higher Bandwith. Hopefully, I can get things back to normal by next week. Sorry of the inconvienience. On 22 Apr 06, I returned home with my New VY Z06, Thanks to Rick Conti and Rick & Penny Morse. On 10 Oct 05, I found out that my '57 had had been selected to go on Display at the NCM for One Year. We'll deliver her on 7 Nov 05. I know Chad will be Proud. On 14 Aug 04, I changed the Vette Rated 100 to Corvette Top. On 14 Oct 03, I added a "Send a Flag to Support Our Troops" banner. On 11 Oct 03, I added picutres of the Air Capital Corvette Club's visit to the Saloon Girls Page. Even though it shows a Tumbnail is not available, just click on it anyway. On 22 Aug I added a Slide Show for Our Saloon Girls and pictures of our latest outing on 9 Aug 03. On 6 Jul, I changed our opening picture to show All 7 of My Corvettes parked infront of Hertiage Park, here in Caldwell, Ks. On 1 June, I added a New Page, Karlee. She is showcasing each of my 7 Corvettes. A must see! On 23 May, I added another Page of 50th Anniversary Corvette Photo's. On 7 April 03, I added pictures of a '53 Reflection in the hoods of my 50th AE Vert and 40th ZR-1 while at the 11 Annual Corvettes of Enid Expo on 5 April. These pictures are on the slide show even though it shows that the thumbnail is not avail. On 19 Jan 03, I added a C5 Smiley Wave. On 11 Nov 02, I added links on My Favorite Links page to the 1953-2003 Commemorative Edition Corvette and the Cherokee Strip Corvette Club. On 14 Oct 02, I added a new page for our Saloon Girls that enterain those that come visit my Showroom. We then go eat at the Last Chance Bar & Grill, here in the Border Queen Town of Caldwell and the Girls but on a Super Show for us. On 16 Sep 02, I added pictures of our NCM Delivery on 12 Sep 02 along with pictures of the 50th & 40th ZR-1 at the Planct and the NCM. On 26 Aug, I added pictures of Our 50th AE Convertible as it was being finsihed on 22 Aug at the Plant. On 17 Aug, I added new pages for my 40th ZR-1 & 35th Anniversary Corvettes and updated my 50th Anniversary Corvette page to show a Born On Date of 22 Aug 02. On 14 Jul, I added links to the CFive Forum, Corvette Forum, and the 50th Registry. On 2 Jul 02, I added pictures of Von & I by the 50th while at the Kick Off on 28 Jun. On 15 June 2002. I added pictures of the 50th Anniversary Corvette to it's own page. On 9 April, I added my Business Card to the contacts page. On 17 March 2002, I changed the USA Flag to the USA-POW Flag IN MEMORY OF ALL THOSE THAT HAVE YET TO RETURN and MY FELLOW POW's. I Returned With Honor on 28 March 1973. In Jan 02, I added a new picture to Chad's Story Page and 3 new pictures of Heather in the Calendar Girls Slide Show, they don't show on the Tumbnails but will if you click on them. In November 2001, I had to revise my 2003 50th Anniversary Edition Order request to a Convertible. I've been informed that there will NOT be an Anniversary Edition for the Z06.